?LCD Screen and Heart-Rate Sensor?LCD Screen quickly view your Speed, Time, Distance, Calories and Heart Rate. Wireless pulse sensor monitors your heart rate to achieve optimal intensity levels. 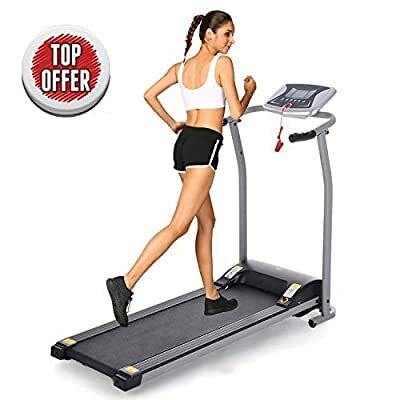 ?Soft Drop System?Frame is made of high quality steel, anti-slip anti-static lawn texture belt, multi-layer composite belt provides useful cushioning for ankle, back and knee joints which gives you excellent experience of running. With the help of soft drop system, you don't need to worry about damaging floor and taking weight of the treadmill when unfolding treadmill for exercise. ?Foldable Design & Low Noise Motor and Safety Emergency?Foldable design and transportation wheels allow for easy move and storage. This foldable treadmill comes with built in safety key to ensure instant shut-off under emergency situation. The 1.5HP motor ensures perfect performance for walking, jogging, running and cardio workout at home. Provide safe and quiet workout experience. ?Space Saving?- Mini foldable treadmill for storage. Max user weight: 260lbs. Unfolded size: 49.21 x 23.58 x 42.13inch; Folded size: 47.25 x 23.58 x 9.45inch; Perfect size for home,dormitory, office use. ?WARRENTY?Our products are all in US warehouse, you can receive it soon. We offer you 100% risk-free satisfaction guarantee to let you buy with confidence. 1 year warranty & Friendly Customer Service. We are quite sure that you will be super-impressed with DURABILITY, PORTABILITY and HIGH QUALITY of our treadmill.